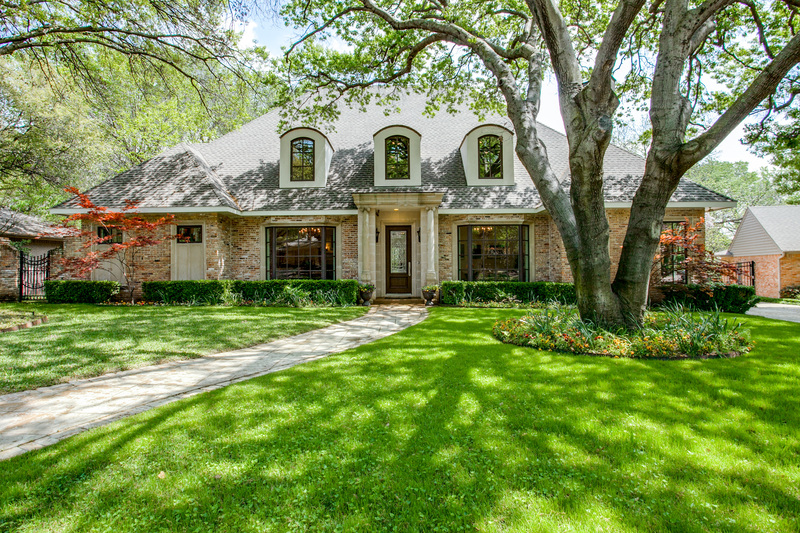 Completely rebuilt in 2005 and situated in prestigious Hockaday Square, 11484 Strait Lane is a fabulous clean lined traditional residence with a soft contemporary feel nestled on a gorgeous 80’ x 219’ lot overlooking the creek. Details include an open floor plan, 10-foot ceilings trimmed with deep molding, gleaming Brazilian walnut hardwoods and spacious entertaining rooms, with the entire rear of the home with French doors opening to scenic views of the gorgeous outdoor oasis. The sophisticated, two-story home offers approximately 5,390 square feet, five bedrooms, 4½ baths, five living areas, two dining areas, a fireplace, veranda, pool, creek view, two-car attached garage, two-car carport and an automatic gate. Enter to an inviting front foyer, which reveals an open floor plan with 10-foot ceilings trimmed with elegant crown molding, a crystal-and-bronze chandelier, and gleaming Brazilian walnut hardwoods. Providing great entertaining flow, the entry is flanked by elegant formal rooms and also leads to the rear of the home, where handsome hardwoods continue. Both with bay windows overlooking views of the front landscaped grounds, the formal living and dining rooms are spacious and are graced by exquisite crystal-and-bronze chandeliers. Surrounded by light-filled floor-to-ceiling windows, the oversized family room is appointed with a wall of richly-stained bookshelves, which open to reveal a hidden closet. Centered by a marble-surrounded fireplace, with a wood-carved mantle and a raised hearth, the spacious den is perfect for relaxation and is also illuminated by a crystal-and-bronze chandelier. Adjacent, an elegant full granite bath serves the area. Showcasing fabulous marble-and-granite counters, the chef’s island kitchen boasts premier stainless appliances, including Thermador and Fisher & Paykel, butler’s and walk-in pantries, a bar serving area, and is also open to an oversized breakfast room. Capped by a vaulted, two-story ceiling with skylights and a crystal-and-bronze chandelier, the breakfast room features a richly-stained built-ins, with bookcases and a china cabinet, and triple French doors open to the veranda. A staircase, with fabulous wrought iron-and-wood balusters, leads upstairs to the second level. Dual balconies, with wrought iron-and-wood balusters, also look down to the first floor. Both with French doors opening to the veranda, the luxurious and private master suite’s credentials include an oversized bedroom and a separate sitting room, each with gleaming hardwoods, deep molding and an abundance of light. The gorgeous marble bath is appointed with His and Hers vanities, a vanity desk area, jetted tub, separate double shower, toilet room with a bidet, and a huge walk-in closet. Fully equipped, a utility room provides built-ins and room for a full-size washer and dryer, and a granite-topped pool bath rounds out the first floor. Second level of living is equally spacious and impressive. Ascending the staircase, first stop is an oversized game room, which is centered by built-ins, with bookcases and storage, and also features handsome hardwoods and dual love seating. Four bedrooms range in size and style, some with love seating or alcoves, and all with gleaming hardwoods, large walk-in closets and are served by two elegant Jack-and-Jill marble baths. Outside, entertaining is effortless! Setting the tone for a sophisticated atmosphere for entertaining, the expansive brick covered veranda overlooks a gorgeous pool, lush landscaped grounds with an abundance of mature trees, including palm trees and crepe myrtles, and the fabulous creek. A two-car attached garage, two-car brick carport and an automatic gate completes this fabulous residence.